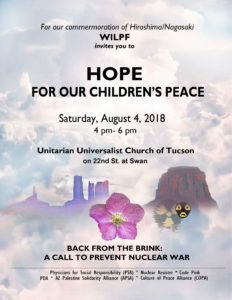 Hiroshma Nagasaki Day Remembrance “Hope for our Children’s Peace” is sponsored by Physicians for Social Responsibility-Arizona , WILPF [Womens international League for Peace and Freedom], Nuclear Resistor and others in the Tucson community. Event is held at the Unitarian Universalist Church Saturday August 4, 2018 from 4 – 6 pm. Our collective supports the elimination of nuclear weapons, agreeing that “low yield” nuclear war is an oxymoron. The 2017 Treaty on the Prohibition of Nuclear Weapons [TPNW] signed by 122 United Nations members to de-legitimize nuclear weapons of the nine nuclear power player nations, and the Nobel Peace award to ICAN [International Campaign to Abolish Nuclear Weapons] has renewed global efforts to push a universal standard of prohibition of nuclear weapons. On August 4 we are taking a short review of the Southern Arizona nuclear industrial complex throught local arts: Author, thesbian and former city-councilor Molly McKasson will do a short reading of her piece “Nukes and the small sweet self.” This is followed by “Acceptable Risks” an archived 1982 Tucson Public Access telelvision piece. The short video addresses health and civilian planning for surviving nuclear war. Imagine this: the 1980 plan includes evacuating a city of half a million people on alternate days to the nearby small mining town of Bisbee, where gathering at the local beauty shop and bar was encouraged for safety in event of a nuclear event in Tucson. The comedic absurdity of the message will not be lost on today’s audience. “Back From the Brink [BFTB]: call to prevent nuclear war” presented by Kathy Altman, board member PSR-Az urges our community groups to sign the pledge and get on board with the movement to support the UN treaty. It is expected to continue to percolate politically and reach the US Senate by maybe 2020. Then our nation will have the opportunity to eliminate nuclear warheads. Impacts of uranium mining on Arizona and Navaho Nation, and ongoing resistance in native communities will be presented by Georgia Conroy of WILPF. Following is presentation from Tucson Veterans for Peace [VFP] members on their journey to peace-making. After a call to audience for comments and questions, Raging Grannies will offer healing songs and lead the group in closure.